Goodyear Poly-V, Thermoid Multi-Ribbed, Gates Micro V, Browning Poly-V, Dayco Poly-Rib, Dodge Poly-V, Maurey Poly-V, MBL Ribstar, Optibelt RB. Our biggest seller for air compressors, motors, appliances, power tools, fans, mixers and much more. These ribbed V-belts are designed to replace OEM belts on extra heavy-duty applications. These Poly-V J rib Sections Belts Cross Reference with: Goodyear Poly-V, Gates Micro-V, Thermoid Multi-Ribbed, Browning Poly-V, Dayco Poly-Rib, Dodge Poly-V, Maurey Poly-V, MBL Ribstar, Optibelt RB. We offer a limited selection online at this time. Please call (317) 519-9020 for more sizes! H, PH Section Belts - 1/16" Rib Width. Industrial Poly V.
Ribs are 1/16" wide (1.2mm Pitch). Poly-V "H" Section Belts (Metric PH Belt) fit special applications such as massage chairs, appliances, laundry machines, and robotic equipment. J, PJ Section Poly-V (Micro V) Belts - 3/32" Rib Width. Click Here to Browse Poly-V Belts (J/PJ Section). Ribs are 3/32" wide (Pitch). Poly-V/Micro V Belts Cross Reference with: Gates Micro-V, Thermoid Multi-Ribbed, Bando Poly-V, Jason, Durkee-Atwood, Browning Poly-V, Dayco Poly-Rib, Dodge Poly-V, Goodyear Poly-V, Maurey Poly-V, MBL Ribstar, Optibelt RB. 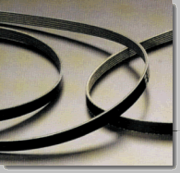 Browse our online Selection of Poly-V Belts (L Section). 3/16 Inch wide (Pitch) ribs. Replace home and industrial appliance belts, outdoor power equipment belts, roller conveyor belts, machine tool drive belts, medical equipment roller belts and exercise equipment belts. 6 Rib belts Only: J Section. 9/16" Wide (Poly-V/Micro-V Belts). Sears Craftsman Air Compressor belts, 6 rib belts, Fan Belts, drive belts, Vari-speed Mixer belt, Floor polisher belts, Burnisher belts, woodworking equipment belts, replacement belts and more. *Look under "Heavy Duty Belts" > "POLY V/MICRO V" link for wider range of 2 to 40 Rib Belt Series and lengths.